The all-in-one Epson Stylus Photo PX730WD printer is a wireless multifunction inkjet printing machine which has been created exclusively to enable photography enthusiasts to print professional quality high-definition images right at home instead of rushing to a lab. The printer also allows them to carry out scanning and copying effortlessly. The printer provides superior Wi-Fi connectivity (Wifi 802.11N feature), 6.3cm LCD touch screen and PC-free printing functions, which gives the user the luxury and convenience of printing images from anywhere around the house. Further, the Epson Stylus Photo PX730Wd printer boasts of automatic front and back printing which saves you from the trouble of flipping pages manually and works with a printing rate of 40 pages per minute in monochrome as well as in colour. One can get high-quality printouts using the Epson Stylus Photo PX730WD Ink Cartridges which are easy to handle and require less maintenance. The printer also reorganizes the process of automatic Wi-Fi set-up and effortlessly gains connectivity with mobile devices, smartphones and tablet PC for streamlined printing. What’s more, it can even print fast directly from a memory card. The Epson Stylus Photo PX730WD printer with the resolution of 150x445x458mm and 9.8 kg weight, hits off with remarkably and configures smoothly with computers and laptops for uninterrupted high-quality wireless printing. It saves you from the hassles of grappling with the complicated network settings or connecting with a USB cable as it locates the appropriate connection settings and configures on its own. It uses both original and compatible range of Epson Stylus Photo PX730WD Ink Cartridges so that you can print in a most affordable range. If you print images on a regular basis for personal or even professional work, the Epson Stylus Photo PX730WD printer is ideal for you. Ease of connectivity and adaptability are its highlights though it needs to improve the quality of text it prints. How can I check the Ink Cartridge status of my Epson Stylus Photo PX730WD printer? Press the OK button and prepare for replacing the Epson Stylus Photo PX730WD Ink Cartridge that is empty. Note: If any low-quality ink cartridge is installed in the machine, the ink cartridge status might not be displayed correctly. One must have the cartridges handy in case the ink cartridge is running low as the ink levels displayed on the screen gives an approximate indication. Even if the quality of the printed document is not improved after performing the print head alignment process, try replacing the Epson Stylus Photo PX730WD Ink Cartridges with the new one. A. You can install the printer driver on your computer by using the CD-ROM that you received with your printer. If you no longer have the CD-ROM, you can download the drivers from the Epson website. Q. Why does the Epson Stylus Photo PX730WD printer have 6 ink cartridge slots instead of the usual 4 ink cartridge slots? A. Epson Stylus Photo PX730WD printers are designed ideally for photographers so that they can print high quality photos with great detail. The PX730WD has 2 extra ink cartridge slots for light cyan and light magenta Epson Stylus Photo PX730WD ink cartridges to be inserted. These extra two slots are added to increase the depth and quality of colour printouts. Q. I have been using original Epson Stylus Photo PX730WD ink cartridges for my printer. However, I wish to reduce my operating costs. How can I do so? A. You can reduce your overall operating costs by switching to compatible ink cartridges instead of using original ones. Our compatible Epson Stylus Photo PX730WD ink cartridges are cheaper than the original ink cartridges while being able to produce the same quality output. You can further reduce your overall operating costs by opting to use our XL compatible ink cartridges. Q. Can using compatible Epson Stylus Photo PX730WD ink cartridges cause damage to my printer? A. Absolutely not! Our compatible ink cartridges are of premium quality that have been FSC tested and certified to work well with your printer. You do not need to worry about any damage caused to your printer while using our compatible ink cartridges. Q. What if I am not available when Epson Stylus Photo PX730WD ink cartridges are out for delivery? A. Our delivery service delivers on Monday to Friday between 9am to 5pm. In case you are not present at the time of delivery, we will attempt to make another delivery of the product to your house. If the delivery is still unsuccessful, the product will be taken back to the main warehouse and an additional charge of €4.95 will be charged by us for any further delivery attempts. Q. Does printing images and graphics with Epson Stylus Photo PX730WD ink cartridges lower the page yield as compared to printing plain text documents with it? A. Yes, ink cartridges use more ink to print images and graphics as compared to text documents, hence, the page yield in case of the former will be lesser. Q. Are light magenta and light cyan also available in a multipack of compatible Epson Stylus Photo PX730WD ink cartridges? A. Yes, these colours are available in the compatible Epson Stylus Photo PX730WD ink cartridges multipack. Q. Does the Epson Stylus Photo PX730WD printer print on both sides of a page? Can I do more with the help of this printer while printing? A. This Epson printer offers double-sided document printing and also does it fast. In addition to that, it can print directly on proper CD and DVDs, which can help you personalise photos, films, gift articles and even digital photo albums. Q. Do all the colour cartridges of the Epson Stylus Photo PX730WD ink cartridges pack print more than 200 pages? A. Yes, in fact they print a lot more than 100 pages. Some of them, such as cyan, even print close to 900 pages. Q. When I install Epson Stylus Photo PX730WD ink cartridges, I get a warning that I’m using non-genuine ink cartridges, which is also repeated. Though I ignore the message, I’m concerned if it will cause any issue to my printer and the warranty on it. A. Please do not worry about these warnings being flashed on your screen; it’s just a tactic that the company employs do to get you to use original cartridges. You can very much go ahead with the compatible cartridges; just take care that you don’t click on any updates that pop up on the screen. Q. Are Epson Stylus Photo PX730WD ink cartridges easy to install? I’ll be attempting it independently for the first time and don’t want to go wrong. A. Yes, these Epson ink cartridges are very easy to install; you can go ahead and install them yourself with the aid of instructions provided in the user manual. Q. How many pages in black do compatible Epson Stylus Photo PX730WD ink cartridges print? A. The black ink cartridges of this series print approximately 300 pages. Q. If I buy a multipack of Epson Stylus Photo PX730WD ink cartridges and one of the cartridges turn out to be faulty, will I be able to return them for free? A. Yes, if that happens, we will accept the faulty ink cartridge for which we bear the costs; you won’t have to pay any. You may consider a replacement also in place of exchange if you so wish. Q. 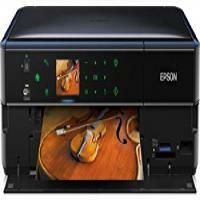 Someone has recommended the Epson Stylus Photo PX730WD printer to me since I pursue photography and intend photographer. Is this printer the right choice for me? A. Yes, absolutely. This printer has been created especially for photographers as you can print fine high-definition photos and also scan and copy from anywhere with it. The printer features Epson's unique Claria Photographic Ink that creates results which surpass even lab quality output every single time. Its high quality Wi-Fi connectivity and features like PC-free printing make printing photographs with it all the more desirable. Q. Are the compatible ink cartridges such as Epson Stylus Photo PX730WD ink cartridges that you recommend keenly really good quality and manufactured in accordance with formal quality standards? A. All the compatible ink cartridges that we offer are manufactured as per strict quality standards and are supplied to customers after being put through proper tests. We offer 100% guarantee on them and also offer free returns and replacement just in case an issue comes up, which is very rare.